I have often been asked about the repertoire for Armonia Celeste and why we do this relatively unknown literature. Actually, the answer is quite easy. It is a fabulous and immense repertoire. The wealth of material is sometimes almost overwhelming. There are a number of high-level composers attached to the courts of Italy, especially the Barberini palaces. This includes people like Luigi Rossi, Mario Savioni, Marc’Antonio Pasqualini, Giacomo Carissimi, and Marco Marazzoli. For example, Marazzoli has 379 cantatas extant, plus a raft of operas and oratorios. Luigi Rossi has a similar amount, and cantatas from other composers number hundreds more. These numbers just highlight the secular music. When one adds in the sacred music by Carissimi, Foggia, and others, the music potentials become vast. These numbers are basically only in Rome; adding the rest of Europe, the numbers grow even more. This is huge repertoire, but numbers only mean something if they are balanced by the quality of the music. This is true in this repertoire. The basic form is the cantata, not the 18th century style of Bach and others, but the emotional, secular style of the 17th century. There is a large variety of styles and forces with numbers of high quality and interesting pieces. Though the greatest share of them are for solo voice, primarily soprano, there are a number of duos, trios and even quartets. This works well for Armonia Celeste. Our three singers all have quite different and unique types of voices and styles; this allows a better fit to these different styles and ranges. Mixing and matching these voices and styles into duets and trios makes for a more interesting program as well. The instrumentalists of Armonia Celeste also add to the variety and match the different styles of composition. 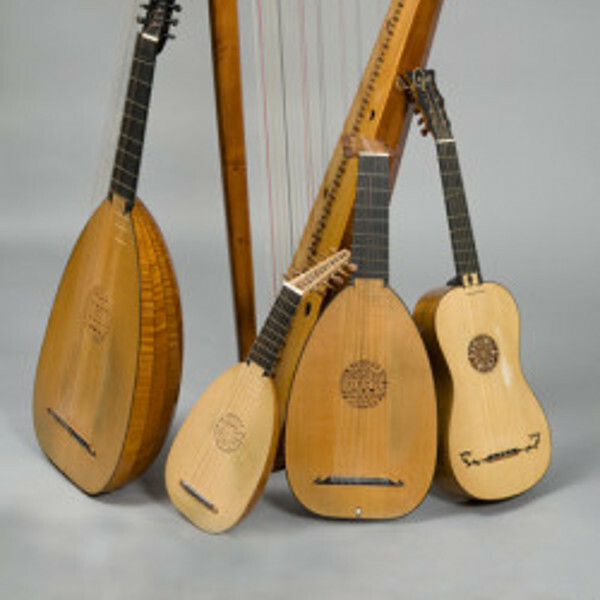 Two of the primary continuo instruments, baroque triple harp and theorbo, are used for the bulk of the continuo realization, but different lutes and guitar can also be called upon when the need arises. The accompaniment of the harp must also have been common. Marco Marazzoli was known as a harp player, and played the famed Barberini harp (of which our harpist plays a rare modern copy), and Luigi Rossi’s wife was also a virtuoso harpist. Theorbo and lute players were common throughout Italy. Kapsberger was even attached to the Barberini courts. The ensemble of three women singers has a long history in Italy. It started in the 1570’s with the “Concerto delle Donne” in Ferrara. This ensemble became so famous that it was imitated in Modena, Florence (under Caccini), and other courts. Though trios were still performed in the 17th century by women, the castrati also became primary singers. Several of them were associated with the operas and other music of the courts, and it became natural for them to sing in the princely chambers when opera was not being performed. This is the basis for the music for Armonia Celeste. Unfortunately, only a small amount of this repertoire is available in modern editions. We are still combing the many manuscripts and prints of the time to bring some of these jewels to the 21st century. This is part of the fun, recreating an exciting era of music for our audiences.